Paula Eiselt’s documentary shows what happens when a Brooklyn woman does the right thing. Rachel “Ruchie” Freier and her husband, Tzvi Dovid Freier. There’s an unfortunate type of documentary that would be better off as a print feature story. That is, a doc that’s a routine collection of facts and arguments, sometimes seemingly pasted together hurriedly, with nothing especially “cinematic” about it that justifies presenting it as a movie. Paula Eiselt’s 93Queen comes perilously close to being one of those documentaries in its first few minutes. But then the personality of Rachel “Ruchie” Freier asserts itself. 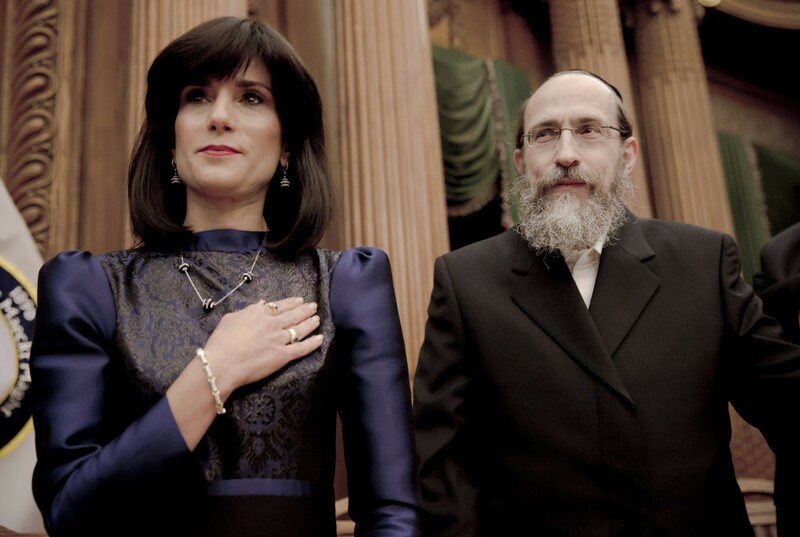 Mrs. Freier, a diminutive, dark-haired attorney and mother of six, lives with her husband Tzvi Dovid Freier and their children in Borough Park, Brooklyn, New York — the largest ultra-orthodox Jewish community in the United States. As a Hasidic wife, Ruchie is expected to conform to certain traditions. Her striking black hair is in fact a wig, a required head covering. As she explains it, “the focus of a woman is to be a mother,” which means, among other things, preparing meals for her family and raising her kids in a strict religious environment. Thus, the Ezras Nashim (Hebrew for “Helping Women”) ambulance service comes into being. It immediately encounters opposition from the patriarchal community elders, who claim such a service is “against the Torah.” A growing number of women, however — along with the New York EMS community — appreciate the service for what it is. Ultimately, Ezras Nashim and Ruchie Freier receive public support for breaking through more than one glass ceiling. It’s clear from watching the bright-eyed, personable Ruchie taking care of business that she has all the energy and purpose of any man in Borough Park, and possibly any man on the face of the Earth. In her spare time, she gets elected as a New York City Civil Court Judge — the first ever Hasidic Jewish woman to hold public office in the U.S. Does she consider herself a feminist? Oh, heaven forbid, even though she concedes, “My connection with secular feminism is fairly obvious.” 93Queen (the title is an emergency dispatchers’ tag line) is a rip-roaring “only in America” success story. Directed by Paula Eiselt. Now playing. 93Queen is not showing in any theaters in the area.